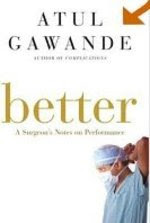 On his great blog Work Matters, Bob Sutton has a thoughtful post about a book with the interesting title Better: A Surgeon’s Notes on Performance. An interesting part of Bob Sutton's comment is what he says about positive deviance. The central idea of positive deviance is to look at those individuals or teams which do far better than the rest and to let the rest of the organization learn from them. Bob Sutton says: "I was taken with the approach. At the same time, I realized that it is remarkably similar to what many companies do when they benchmark: they find the very best performers in their industry – or another industry – and then try to imitate everything they do as closely as possible. This method can be useful, but at the same time, as our work on evidence-based management shows, it is a risky method if done in a casual way, without thinking about what you are imitating and why." I agree with Bob Sutton and commented this: "I agree with 'Don’t just look at winners, look at winners and losers.' I agree with you that the positive deviance approach as described here has the disadvantage of creating a benchmarking situation. An alternative would be to look at positive deviance not only within the system (organization) as a whole but to look at positive deviance within individual members of the system too. Both with top performers and underperformers you could look at when what they did worked well. If you can identify WITHIN the performance of an underperformer when his performance was adequate or even quite good you can then invite the individual to treat this like an 'INTERNAL BENCHMARK'. This will lead to finding 'internal solutions' which have a higher chance of working because people (1) know how to apply them, (2) have the skill to apply them, and (3) trust in the relevance and effectiveness of the solution. This is one of the basic ideas of the solution-focused approach: help people to learn from their past successes. This can be done even if, overall, they don't function too well at a specific moment. There will always be moments when things have been better (or slightly better). These are the moments from which you often can learn a lot."